No workspace is complete without a computer desk, printer stand and/or computer workstation. Our selection of computer desks are constructed of wood and/or metal components to ensure durability for years to come. 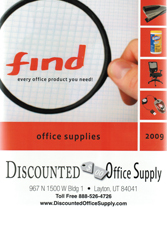 Whether you need an adjustable height computer desk, mobile computer workstation, a printer stand for your oversized printer, an equipment stand for reams of office paper or your simply looking for a keyboard drawer to fit your computer desk, Discounted Office Supply is your source for your next computer desk at a great price! With such a large selection of computer desk styles to choose from Discounted Office Supply is your source for your next computer desk. Most all of our computer desks accomodate CPU towers, keyboards, mice and have ample room for storage media, computer peripherals and/or computer desk accessories. Browse our collection of wood and metal computer desks below. Order your computer desk today and enjoy the comforts of your new desk tomorrow. Discounted Office Supply also has a large selection of office desks to choose from, click here for more information.